As technology has evolved and grown increasingly powerful, cyberattacks from malicious individuals and organizations have escalated, both in frequency and magnitude. Thus cybersecurity has become a hot topic for discussion over the past few years among governments, companies and other organizations. Cyber threats are now an undeniable reality, and attacks can originate from virtually anywhere. 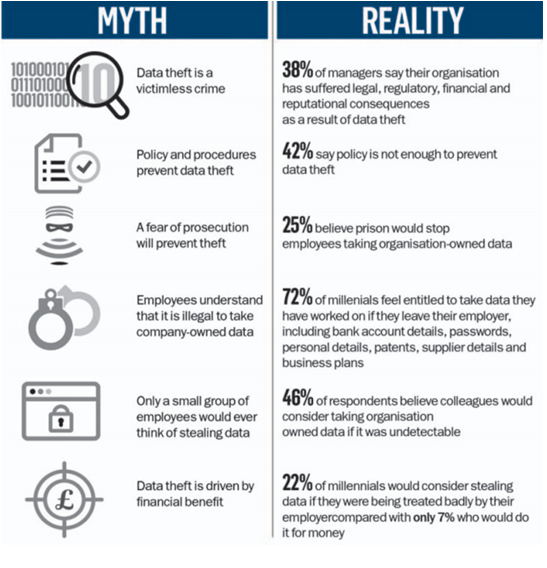 Businesses, especially, are seeing increasing threats to their systems and looking for ways to protect their data and the data of their customers. Survey says: cyberattacks on the rise, cybersecurity slowly becoming a priority for companies and organizations. No industry is immune. 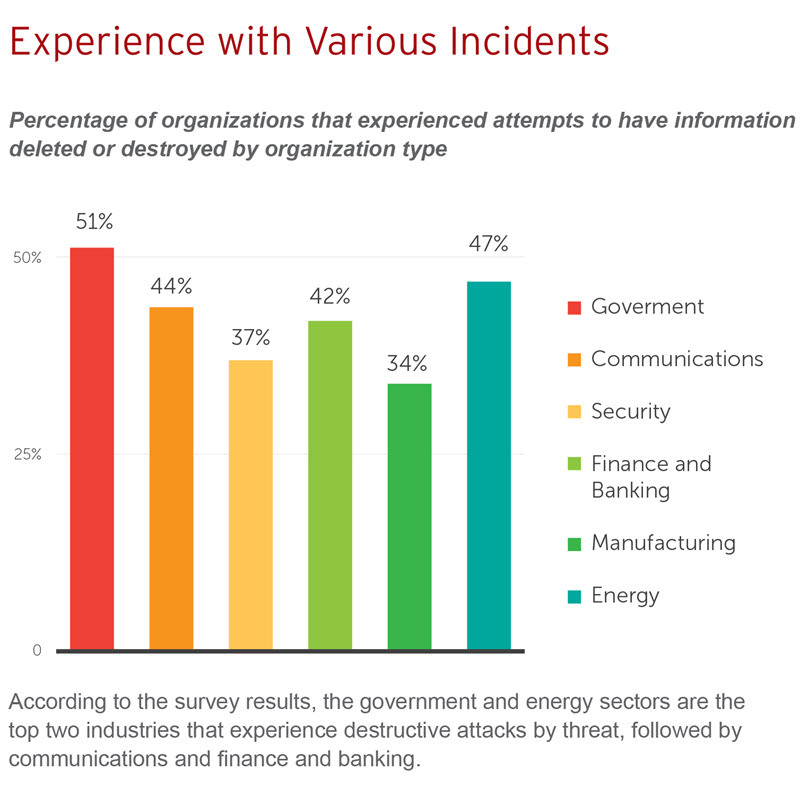 While organizations in the government and energy sectors are targeted most of­ten, the areas of communications, finance and banking, security, and manufacturing also face significant challenges.5 This indicates that there is not one “safe” industry; all must be alert and proactively protect their information and the information of their customers. Threats appear through a variety of tactics. Phishing is the most common type of attack used against organizations, at 71%; however, many other methods are also popular, including attacking unpatched vulnerabilities, DDos, SQL injection, cross-site scripting, and hacktivist-originated attacks, among others.7 This varied arsenal highlights the fact that hackers are growing increasingly sophisticated, and organizations must enact and enforce greater security measures to protect themselves. 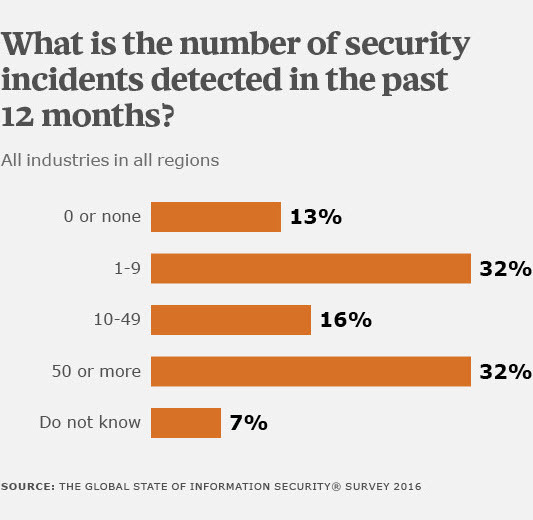 As the chart below indicates, a majority of organizations in both North and South American countries are only somewhat prepared to handle cyber incidents. In fact, there are five nations that say they are unreservedly unprepared, and only two that say they are prepared. 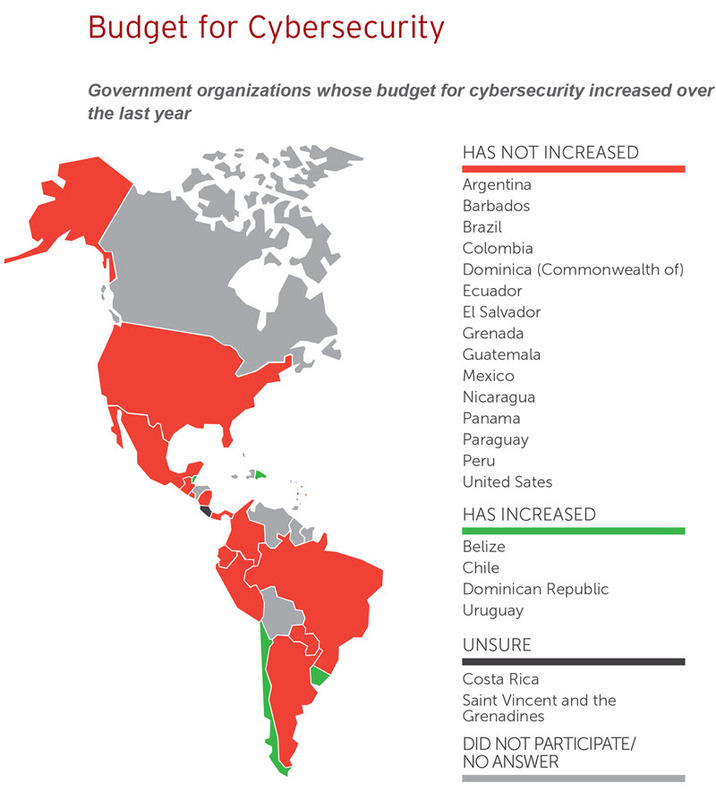 Moreover, government organizations in the countries that say they are only somewhat prepared have not increased their budgets for cybersecurity at all over the past year. These include the U.S., Mexico, and Colombia. Since most attacks cannot be detected using traditional security measures, an increased cybersecurity budget to enable the implementation of new tools is truly vital.9 This disconnect should be a red flag to companies and organizations. It is imperative that resources be allocated to cybersecurity efforts. Most organizations surveyed (69%) report that they have a cybersecurity awareness program for employees. 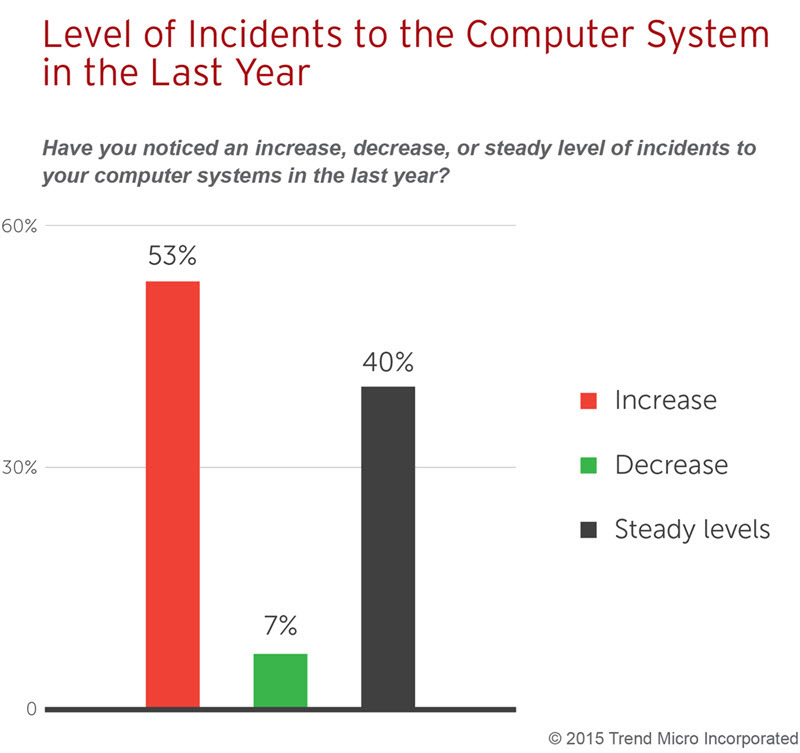 However, only about half have a disaster recovery plan or a cyber incident response plan, and just over one-third say they have adopted industrial security standards.10 These underwhelming levels of preparedness again indicate that while companies and organizations realize the potential threats and do not feel prepared, they are not taking the necessary steps to better position themselves in the face of threats. “It’s not a question if 9-11 will be repeated, but when it will be repeated. It may not be the same thing as the 9-11 event at the World Trade Center, but it will be similar. Next time it will more likely be of cyber origin, affecting power grids, financial exchanges, transportation assets or public health infrastructure instead of a building tower. The problem remains that key law enforcement and intelligence communities are silo-focused. Unless companies and government agencies take a holistic and focused approach to national cyber risks, we are likely to see a disjointed and ineffective response to a cyberattack.” - Tim McNamara, Managing Partner, Boyden Washington D.C.
Risk management initiatives also warrant greater attention. In a survey conducted recently by the AICPA (American Institute of Certified Public Accountants), Chief Financial Officers (CFOs) and equivalent senior executives reveal some insight into their companies’ risk management policies, procedures and initiatives. The survey found that nearly six in 10 say that the volume and complexity of risks have evolved over the past five years. “Organizations are intensively seeking senior cyber talent, though they are having a difficult time finding the right candidates. It’s a very complicated sector with bifurcated responsibilities. Consequently, there are multiple strategies to address cybersecurity needs among the commercial, military and defense, and intelligence sectors.” -Tim McNamara, Managing Partner, Boyden Washington D.C. 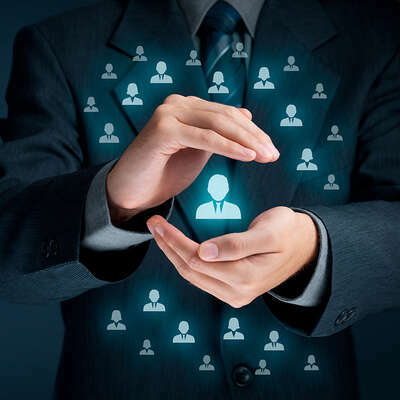 The Chief Security Officer (CSO) or Chief Information Security Officer (CISO) can be a powerful position at companies and organizations that make security a priority and allocate proper resources to its enforcement. 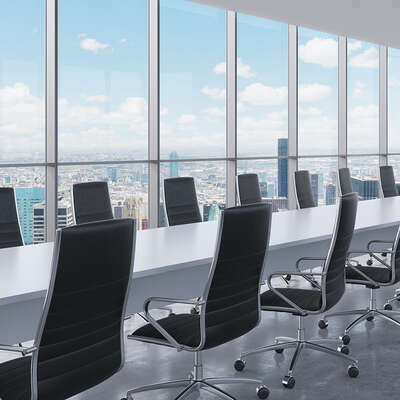 Unfortunately, CSOs/CISOs are not always given the esteem they deserve, and are not always considered an equal and integral part of the C-Suite. The position faces many challenges. 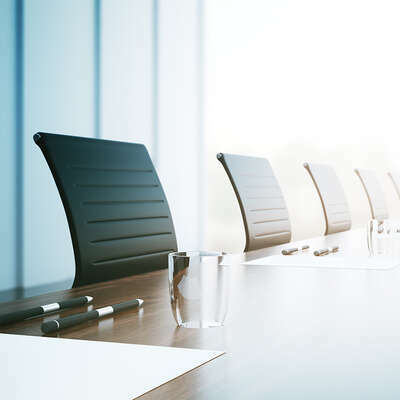 There is a general feeling among CEOs and others in the C-Suite that CISOs would be unlikely to succeed in other leadership positions outside of information security.21 This could be related to the technical nature of the CISO’s role, as compared to other C-level functions. Moreover, blame is often cast on the CISO following any breaches of security within the company. 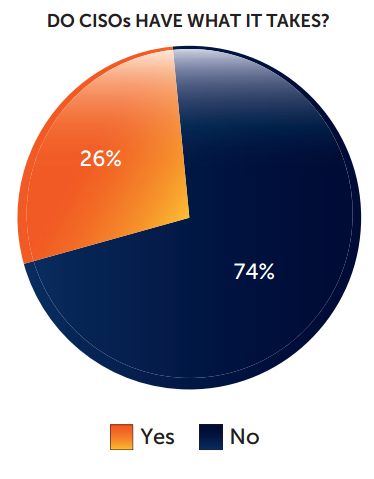 In fact, in a survey by ThreatTrack Security of C-level executives at companies that employ a CISO, 44% say that CISOs “should be accountable for any organizational data breaches.” And surprisingly, more than half of respondents (54%) say CISOs should not make purchase decisions for cybersecurity- related expenses.22 This disconnect, where CISOs do not have decision-making authority but are blamed when issues arise, can be a significant barrier within organizations. Only 26% of C-level executives agree that CISOs should be part of an organization’s senior leadership team. As cyberattacks and data breaches grow more ubiquitous, the demand for cybersecurity professionals dramatically increases. According to the Cisco 2014 Annual Security Report, there is a worldwide shortage of information security professionals, with 1 million open positions.30 According to the 2015 (ISC)2 Global Information Security Workforce Study of 14,000 security professionals,31 the information security workforce shortfall is widening. In 2015, 62% of survey respondents reported that their organizations have too few information security professionals, compared to only 56% when the survey was last conducted in 2013. The reasons for the dearth also changed. In 2013, budgetary restraints were the main reason cited for a lack of security staffing, but as the economy has improved and organizations have placed greater priority on security measures, the main rationale cited for the shortfall in 2015 is a lack of qualified candidates. There is no definitive career path to becoming a CISO or CSO. In general, the ideal candidate must be well-versed in all parts of a business, not technology alone. According to Bruce Schneier, CTO of Co3 Systems Inc., “If you want to be a CISO you need tech skills and people skills and that’s pretty hard to find.”34 CSOs will not only need to be able to communicate to the IT department, but also to the C-Suite, the legal department, and even the PR/marketing department, in the event of a crisis. Additionally, CSOs need to be able to keep up with ever-evolving technological and political landscapes. On the technology front, cloud computing, BYOD (bring-your-own-device), and mobility trends in the workplace are constantly forcing companies to rethink their practices as the boundaries between corporate networks blur and the outside world poses new security challenges.35 A CSO must have the skillset to protect valuable company systems and data as technology changes and is adopted. On the political front, a CSO must be able to deal with the issues related to compliance with corporate security policies, especially when it is difficult to limit corporate use of cloud computing to approved certified cloud providers and very simple to access work emails on a personal cell phone.36 In today’s workplace, CSOs must create a secure environment while also giving employees some level of freedom and flexibility. Lastly, CSOs must be able to establish a sense of authority within a company and be a cultural fit.40 Along with the other executives in the C-Suite, CSOs must exert influence and have a public presence within the company. 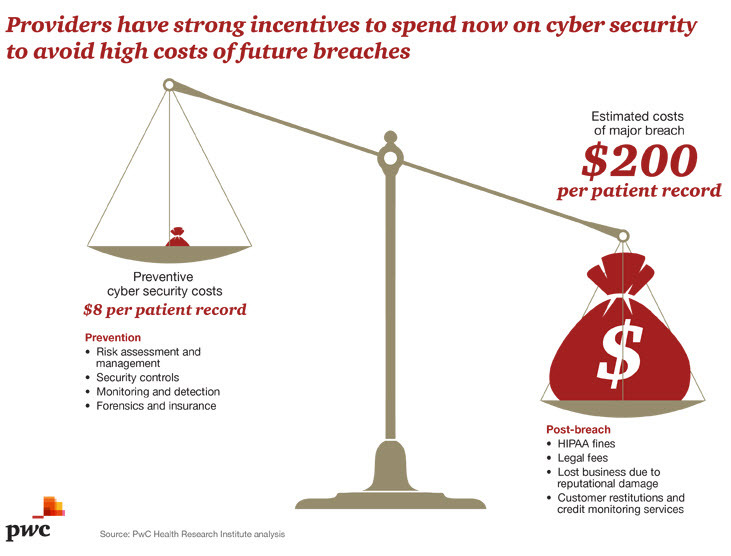 Despite the potentially straightforward solutions that now exist, there are industry-specific complications that make cybersecurity initiatives challenging to implement for healthcare enterprises. For example, each insurance company, hospital, clinic or office has its own system and interface. Implementing cybersecurity solutions will not be seamless across these often different platforms, and yet these organizations work together and share data, leaving apparent holes of which hackers can easily take advantage. Adding to the dilemma, the Affordable Care Act requires electronic health record implementation.43 Together, these issues make cybersecurity initiatives a challenge for the healthcare industry, despite the growing need for security. The financial services sector has been a target of cyberattacks for many years, since the types of information to which banks have access are both highly confidential and valuable to hackers. Regulators have stressed the importance of taking risk management very seriously.46 According to PwC’s State of Information Security Survey for 2016, three key findings stand out for the financial services sector in the coming year. The following firms epitomize the changes taking place across a set of diverse industries facing cybersecurity threats. NATS is a UK-based provider of air traffic control services. Each year, the company handles over 2.2 million flights and 220 million passengers in UK airspace alone, in addition to working with more than 30 countries across Europe, the Middle East, Asia and North America.60 According to NATS, air traffic control services face cybersecurity threats such as being a soft target for hackers, who could potentially spoof a fake aircraft by transmitting a fake signal.61 In 2014, NATS hired Andrew Rose as its CISO and head of cybersecurity. Prior to joining NATS, Rose served as the Principal Analyst for Forrester Research’s Security and Risk practice, and as a CISO in the legal sector.62 In his role at NATS, Rose is less involved with on-the-ground decision making, and instead focuses on communicating the importance of spending money on cybersecurity to the executive board of the company. FTI Consulting (NYSE: FCN) is a global business advisory firm dedicated to helping organizations protect and enhance enterprise value in an increasingly complex legal, regulatory and economic environment. Boyden sat down with two of FTI’s cybersecurity and risk management experts from the US and Europe for their perspectives. Scott Corzine is a Managing Director at FTI Consulting in New York. He is in the Global Insurance Practice in the Forensic & Litigation Consulting segment and co-heads the Risk Management Consulting group. Corzine is considered an expert in operational resilience, business continuity and IT disaster recovery management, cybersecurity, and emergency and crisis management. Alejandro Sánchez is a Senior Director in FTI’s Brussels office. He is the former Head of Cabinet of the Spanish Secretary of State for Security as well as the former Head of the Spanish delegation to the EU Standing Committee on Operational Cooperation on Internal Security. Sánchez is also a member of the American Chamber of Commerce EU Security and Defence Committee. Boyden: What are companies facing cybersecurity threats doing to protect themselves? Corzine: Across the board, in some cases more aggressively and proactively than others, companies are stoking up their weaponry to keep the bad guys out, as assessments highlight areas of technical vulnerabilty. When the bad actors create a new offensive weapon, defenses have to be upgraded. So, as the bad guys get better at how they attack, the good guys are getting more aggressive with how they defend themselves, in an endless and unavoidable cycle of escalation. That includes all the “toys” that companies buy around perimeter defense, access control, intrusion detection, and all those kinds of issues. Good companies are spending aggressively on those defenses, some as much as 10 percent or more of their IT budgets. Lesser companies often are spending less aggressively, averaging less than five percent of IT spending. Boyden: Are boards and senior management taking greater notice in terms of their actions? Corzine: Ten or 15 years ago, in the directors’ board book that they receive before every quarterly company meeting, the meaty sections were on financial results, manufacturing operations, executive compensation and the like. Risk management might have been all of a paragraph or a page. Today, smart companies are spending a lot more board attention and C-Suite preparation on risk management, and cybersecurity is certainly a key topic. But, it goes further than that. Directors are interested in the implications of any personal D&O liability exposure. A significant data breach – and a bungled response by management – can immediately impact share price and reputation, and it takes somewhere on the order of 80 weeks on average to begin reputation recovery. So, in addition to having faith in their CIO and having a CISO in place, we’re seeing boards hiring outside. Also, third-party experts are coming in and independently “kicking tires,” reporting to the board on alignment with an information security standard or framework, and then benchmarking the organization against its industry peers. This typically can lead to a vulnerability remediation plan and a more robust cyber incident response plan. It’s all part of an increased emphasis we’re seeing on governance, risk and compliance at the board level around operational risk, especially cybersecurity. Sánchez: I’m convinced that it has become a bigger priority for most companies. If you follow the amount of cyberattacks that big companies receive – as well as small- and medium-sized companies – and discover at the end of the year that you have spent a lot of money in order to remedy the situation, boards and companies realize they must invest in resources and human capital to avoid the same situation down the line. 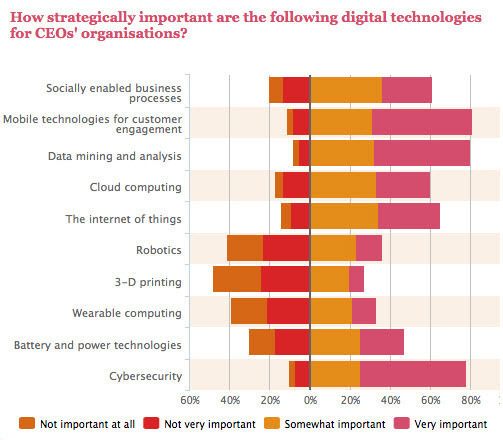 The CIO, CISO, HR and the communications teams must be closely linked to the senior executive levels. Boyden: Do you see cybersecurity as something organizations know they need? Or do you see some reluctance in implementing measures that they know may be necessary? But the problem is that there are essentially two kinds of companies in the world, in our view – companies that have been hacked and know it, and companies that have been hacked that haven’t figured it out yet. So, if it’s not on their top line of awareness from a risk management perspective at the board level, they’re probably doing something wrong. Boyden: How does resilience play a role in cybersecurity strategy? Corzine: Because vulnerability to a hack is so pervasive, “resilience” is a rational objective for CISOs and for boards. “Prevention” is a nice aspiration, but an irrational objective that will forever be thirsty for funding. We believe that some of organizations’ IT security spend needs to move from the prevention and detection side over to the response and recovery side, in terms of a budget remix. The costs for reputation recovery can be staggering. Hiring a top cyber forensics team, paying for crisis communications expertise, and having experts who can prepare executives for regulatory or Congressional testimony, are all key relationships companies should explore, because it’s hard to do all that internally after they’ve suffered a breach.